No medals, big hats or any other prizes will be given to persons guessing that this beach is long (by Bermudian standards) and situated in Warwick Parish. 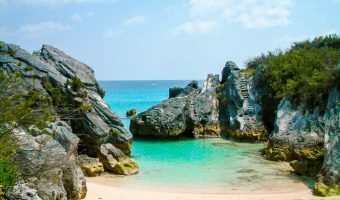 With more than half a mile of uninterrupted pink sand it’s the most easterly of the beaches of South Shore Park and the longest in Bermuda. Although open and exposed to southerly winds, the waves are generally moderate due to the nearby reef. The many broilers found at the reef are an interesting feature. Warwick Long Bay is rarely busy and attracts the local dog-walking, jogging and walking fraternities. Visitors frequently have the beach to themselves. The beach is backed by scrubland and grasses. 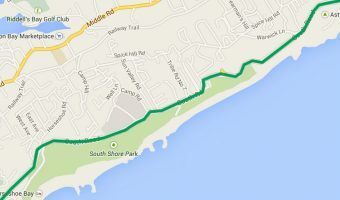 A path runs through this area taking you to Jobson’s Cove, Horseshoe Bay and the other beaches of South Shore Park. Go for a stroll. You won’t regret it. Jobson’s Cove is particularly picturesque. Spicelands Riding Centre offers horse rides along this trail. The main entrance is at the west end of beach. The short road winds down to a car park providing easy access to both Warwick Long Bay and Jobson Cove. There are public restrooms here and in the summer there’s a concession that sells drinks, hot dogs and other snacks. There’s also an entrance at the eastern end of the beach. There’s also parking here plus a children’s playground with a climbing frame, slides, and swings. Bus number 7 runs between Hamilton and Dockyard and stops near both entrances. Map showing location of Warwick Long Bay. If you want to avoid the crowds at Horseshoe Beach come here. It is very beautiful and the water very blue. If you walk along towards Horseshoe you will find several secluded coves. This is a very beautiful beach. It was big but not crowded at all. There was a truck where you could buy food. The only downside was that the restrooms were quite dirty. I guess that’s just the price you pay for solitude. Given the choice of beaches to visit, this one now wins hands down. It’s huge and doesn’t get the crowds that Horseshoe Bay Beach does. Granted, there’s little in the way of facilities – only a portable toilet and a guy selling refreshments (sometimes) but don’t let that put you off. If you’ve got kids and want to let them swim, it’s easy to walk to Jobson’s Cove, which is sheltered and calm. I got off the bus by accident at this beach trying to go the Horseshoe Bay beach. Best mistake I ever made! This is best by far the most beautiful beach I have even been to. There was a total of 6 people there besides my family. I now have been there 4 times in the past 5 years. When I got back on the bus to leave and went by Horseshoe Bay there at least a thousand people there. This is heaven on earth. I will replay images from this place for the rest of my life. One of the most beautiful beaches I’ve ever been on in my life. Perfectly secluded and beautiful! Good snorkeling. Stay away from Horseshoe, which will no doubt be completely mobbed. Take the bus! You can walk from here to Horseshoe Bay, where you’ll find a cafe etc. It’s a fabulous walk. Beautiful gallery of images of beaches by renowned photographer Gavin Howarth. Includes photographs of Astwood Cove, Devonshire Bay, Warwick Long Bay, and Church Bay.